The Baltic Sea is a mediterranean sea located between Central and Northern Europe, from 53°N to 66°N latitude and from 10°E to 30°E longitude. 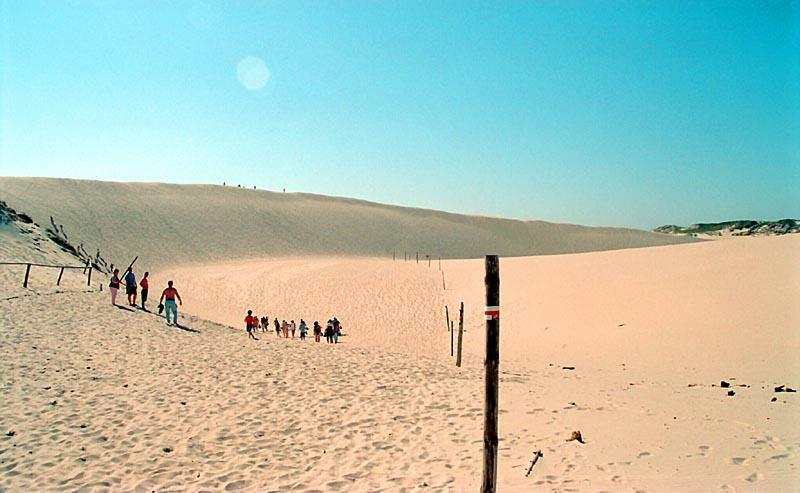 It is bounded by the Scandinavian Peninsula, the mainland of Europe, and the Danish islands. It drains into the Kattegat by way of the Øresund, the Great Belt and the Little Belt. The Kattegat continues through Skagerrak into the North Sea and the Atlantic Ocean. The Baltic Sea is connected by man-made waterways to the White Sea via the White Sea Canal, and to the North Sea via the Kiel Canal. The Baltic Sea might be considered to be bordered on its northern edge by the Gulf of Bothnia, on its northeastern edge by the Gulf of Finland, and on its eastern edge by the Gulf of Riga. These various gulfs can also be considered part of the Baltic Sea. While Tacitus called it Mare Suebicum after the Germanic people of the Suebi, the first to name it also as the Baltic Sea (Mare Balticum) was eleventh-century German chronicler Adam of Bremen. The origin of the latter name is speculative. It might be connected to the Germanic word belt, a name used for two of the Danish straits, the Belts, while others claim it to be derived from Latin balteus (belt). However it should be noted that the name of the Belts might be connected to Danish bælte, which also means belt. Furthermore Adam of Bremen himself compared the Sea with a belt stating that the Sea is named so because it stretches through the land as a belt (Balticus, eo quod in modum baltei longo tractu per Scithicas regiones tendatur usque in Greciam). He might also have been influenced by the name of a legendary island mentioned in The Natural History by Pliny the Elder. Pliny mentions an island named Baltia (or Balcia) with reference to accounts of Pytheas and Xenophon. It is possible that Pliny refers to an island named Basilia ("kingdom" or "royal") in On the Ocean by Pytheas. Baltia also might be derived from "belt" and means "near belt of sea (strait)". Meanwhile others have concluded that the name of the island originates from the Indo-European root *bhel meaning white, fair. This root and its basic meaning were retained in both Lithuanian (as baltas) and in Latvian (as balts). On this basis, a related hypothesis holds that the name originated from this Indo-European root via a Baltic language such as Lithuanian. Yet another explanation is that, while derived from the afore mentioned root, the name of the sea is related to naming for various forms of water and related substances in several European languages, that might have been originally associated with colors found in swamps. Another explanation is that the name was related to swamp and originally meant "enclosed sea, bay" as opposed to open sea. Some Swedish historians believe the name derives from the cripple secondary god Balder of Nordic mythology. In the Middle Ages the sea was known by variety of names, the name Baltic Sea started to dominate only after 16th century. Usage of Baltic and similar terms to denote the region east from the sea started only in 19th century. Baltic Sea is used in English; in the Baltic languages Latvian (Baltijas jūra) and Lithuanian (Baltijos jūra); in Latin (Mare Balticum) and the Romance languages French (Mer Baltique), Italian (Mar Baltico), Portuguese (Mar Báltico), Romanian (Marea Baltică) and Spanish (Mar Báltico); in Greek (Βαλτική Θάλασσα); in Albanian (Deti Balltik); in Welsh (Y Môr Baltig); in the Slavic languages Polish (Morze Bałtyckie or Bałtyk), Czech (Baltské moře or Balt), Croatian (Baltičko more), Slovenian (Baltsko morje), Bulgarian (Baltijsko More, Балтийско море), Kashubian (Bôłt), Macedonian (Балтичко Море, Baltičko More), Ukrainian (Балтійське море, "Baltijs'ke More"), Belarusian (Балтыйскае мора, "Baltyjskaje Mora"), Russian (Балтийское море, "Baltiyskoye Morye") and Serbian (Балтичко море, Baltičko more). In Germanic languages, except English, East Sea is used: Afrikaans (Oossee), Danish (Østersøen), Dutch (Oostzee), German (Ostsee), Icelandic and Faroese (Eystrasalt), Norwegian (Østersjøen), and Swedish (Östersjön). In Old English it was known as Ostsæ. In addition, Finnish, a Baltic-Finnic language, has calqued the Swedish term as Itämeri "East Sea", disregarding the geography (the sea is west of Finland), though understandably since Finland was a part of Sweden from the Middle Ages until 1809. In another Baltic-Finnic language, Estonian, it is called the West Sea (Läänemeri), with the correct geography (the sea is west of Estonia). At the time of the Roman Empire, the Baltic Sea was known as the Mare Suebicum or Mare Sarmaticum. Tacitus in his AD 98 Agricola and Germania described the Mare Suebicum, named for the Suebi tribe, during the spring months, as a brackish sea when the ice on the Baltic Sea broke apart and chunks floated about. The Suebi eventually migrated south west to reside for a while in the Rhineland area of modern Germany, where their name survives in the historic region known as Swabia. The Sarmatian tribes inhabited central Europe and southern Russia. Jordanes called it the Germanic Sea in his work, the Getica. In addition to fish the sea also provides amber, especially from its southern shores. The bordering countries have traditionally provided lumber, wood tar, flax, hemp and furs. Sweden had from early medieval times also a flourishing mining industry, especially on iron ore and silver. Poland had and still has extensive salt mines. All this has provided for rich trading since the Roman times. In the early Middle Ages, Vikings of Scandinavia built their trade empire all around the Baltic. Later, there were fights for control over the sea with Wendish tribes dwelling on the southern shore. The Vikings also used the rivers of Russia for trade routes, finding their way eventually to the Black Sea and southern Russia. This Viking-dominated period is also referred to as Viking Age. Lands next to the sea's eastern shore were among the last in Europe to be converted into Christianity in the Northern Crusades: Finland in the twelfth century by the Swedes, and what are now Estonia and Latvia in the early thirteenth century by the Danes and the Germans (Livonian Brothers of the Sword). The Teutonic Knights gained control over parts of the southern and eastern shore of the Baltic Sea, where they set up their monastic state while fighting the Poles, the Danes, the Swedes, the Russians of ancient Novgorod, and the Lithuanians (the last Europeans to convert to Christianity). In the 12th century, there was intensification of Baltic Slavic piracy. Starting in the 11th century, the southern and eastern shores of the Baltic were settled by Germans (and to a lesser extent by Dutch, Danes and Scots) in the course of the Ostsiedlung. The Polabian Slavs were gradually assimilated by the Germans. Denmark gradually gained control over most of the Baltic coast, until she lost much of her possessions after being defeated in the 1227 Battle of Bornhöved. 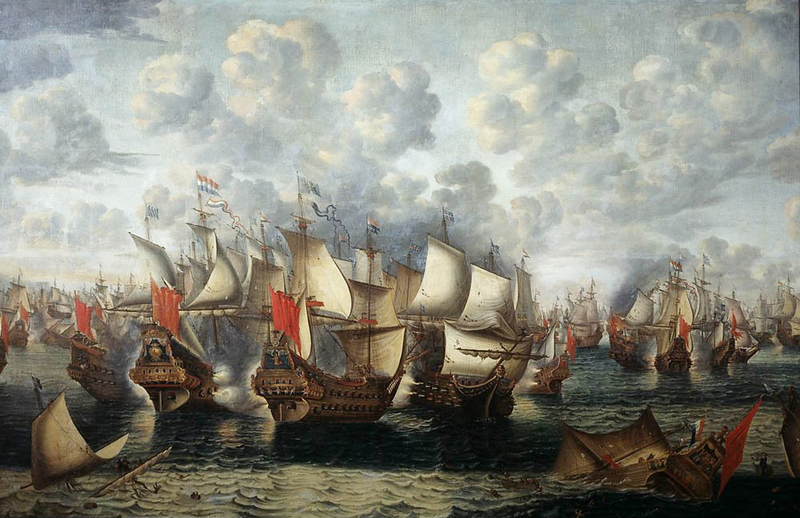 The naval Battle of the Sound took place on 8 November 1658 during the Dutch-Swedish War. In the 13th to 17th centuries, the strongest economic force in Northern Europe became the Hanseatic league, which used the Baltic Sea to establish trade routes between its member cities. In the seventeenth century the Dutch became the dominant traders. In the sixteenth and early seventeenth centuries, Polish-Lithuanian Commonwealth, Denmark and Sweden fought wars for Dominium Maris Baltici ("Ruling over the Baltic Sea"). Eventually, it was the Swedish Empire that virtually encompassed the Baltic Sea. In Sweden the sea was then referred to as Mare Nostrum Balticum ("Our Baltic Sea"). In the eighteenth century, Russia and Prussia became the leading powers over the sea. The Great Northern War, ending with Sweden's defeat, brought Russia to the eastern coast. Since then, Russia was a dominating power in the Baltic. Russia's Peter the Great saw the strategic importance of the Baltic and decided to found his new capital, Saint Petersburg, at the mouth of the Neva river at the east end of the Gulf of Finland. There was much trading not just within the Baltic region but also with the North Sea region, especially eastern England and the Netherlands: their fleets needed the Baltic timber, tar, flax and hemp. During the Crimean War, a joint British and French fleet attacked the Russian fortresses by bombarding Sveaborg, which guards Helsinki; Kronstadt, which guards Saint Petersburg; and by destroying Bomarsund in the Åland Islands. After the unification of Germany in 1871, the whole southern coast became German. The First World War was partly fought in the Baltic Sea. After 1920 Poland was connected to the Baltic Sea by the Polish Corridor and enlarged the port of Gdynia in rivalry with the port of the Free City of Danzig. 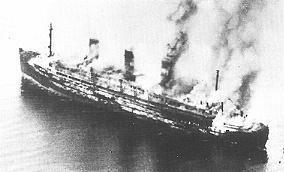 The burning Cap Arcona shortly after the attacks, 3 May 1945. Only 350 of the 4,500 prisoners who had been aboard the Cap Arcona survived. During the Second World War, Germany reclaimed all of the southern shore and much of the eastern by occupying Poland and the Baltic states. In 1945, the Baltic Sea became a mass grave for retreating soldiers and refugees on torpedoed troop transports. The sinking of the Wilhelm Gustloff remains the worst maritime disaster, killing (very roughly) 9,000 people. In 2005, a Russian group of scientists found over five thousand airplane wrecks, sunken warships, and other material mainly from the Second World War, lying at the bottom of the sea. Since the end of World War II, various nations, including the Soviet Union, the United Kingdom and the United States, have disposed of chemical weapons in the Baltic Sea, raising concerns of environmental contamination. Even now fishermen accidentally retrieve some of these materials: the most recent available report from the Helsinki Commission notes that four small scale catches of CW munitions representing approximately 105 kilograms (231 lbs) of material were reported in 2005. This is a reduction from the 25 incidents representing 1,110 kilograms (2,447 lbs) of material in 2003. Until now, the U.S. government refuses to disclose the exact coordinates of the wreck sites. Rotting bottles leak Lost and other substances, thus slowly poisoning a substantial part of the Baltic Sea. After 1945, the German population was expelled from all areas east of the Oder-Neisse line, making room for Polish and Russian settlers. Poland gained a vast stretch of the southern shore, Russia gained another access to the Baltic with the Kaliningrad Oblast. The Baltic states on the eastern shore were occupied by the Soviet Union and became communist states. The sea then was a border between opposing military blocs: in the case of military conflict, in parallel with a Soviet offensive towards the Atlantic Ocean, communist Poland's fleet was prepared to invade the Danish isles. This border status also impacted trade and travel, and came to an end only after the collapse of the communist regimes in Central and Eastern Europe in the late 1980s. Since May 2004, on the accession of the Baltic states and Poland, the Baltic Sea has been almost entirely surrounded by countries of the European Union (EU). The only remaining non-EU areas are the Russian metropolis of Saint Petersburg and the Kaliningrad Oblast exclave. Historic flood events were the All Saints' Flood of 1304 and other floods in the years 1320, 1449, 1625, 1694, 1784 and 1825. Little is known of their extent. From 1872, there exist regular and reliable records of water levels in the Baltic Sea. The highest was the 1872 Baltic Sea flood when the water was an average of 2.43 metres above sea level at Warnemünde and a maximum of 2.83 metres above sea level in Warnemünde. In the last very heavy floods the average water levels reached 1.88 m above sea level in 1904, 1.89 m in 1913, 1.73 m in January 1954, 1.68 m on 2–4 November 1995 and 1.65 m on 21 February 2002. The Baltic Sea is one of the largest brackish inland seas by area. The Baltic Sea occupies a basin (a zungenbecken) formed by glacial erosion during the last few ice ages. The Baltic Sea is about 1,600 km (1,000 mi) long, an average of 193 km (120 mi) wide, and an average of 55 m (180 ft, 30 fathoms) deep. The maximum depth is 459 m (1506 ft) which is on the Swedish side of the center. The surface area is about 377,000 km² (145,522 sq mi) and the volume is about 20,000 km³ (5040 cubic miles). The periphery amounts to about 8,000 km (5,000 mi) of coastline. In the Little Belt. A line joining Falshöft (54°47′N 9°57.5′E﻿ / ﻿54.783, 9.9583) and Vejsnæs Nakke (Ærö: 54°49′N 10°26′E﻿ / ﻿54.817, 10.433). In the Great Belt. A line joining Gulstav (South extreme of Langeland Island) and Kappel Kirke (54°46′N 11°01′E﻿ / ﻿54.767, 11.017) on Island of Lolland. In Guldborg Sound. A line joining Flinthorne-Rev and Skjelby (54°38′N 11°53′E﻿ / ﻿54.633, 11.883). In the Sound. A line joining Stevns Lighthouse (55°17′N 12°27′E﻿ / ﻿55.283, 12.45) and Falsterbo Point (55°23′N 12°49′E﻿ / ﻿55.383, 12.817). In the south, the Bay of Gdańsk lies east of the Hel Peninsula on the Polish coast and west of the Sambia Peninsula in Kaliningrad Oblast. The Bay of Pomerania lies north of the islands of Usedom and Wolin, east of Rügen. Between Falster and the German coast lie the Bay of Mecklenburg and Bay of Lübeck. The westernmost part of the Baltic Sea is the Bay of Kiel. The three Danish straits, the Great Belt, the Little Belt and The Sound (Ö/Øresund), connect the Baltic Sea with the Kattegat bay and Skagerrak strait in the North Sea. On the long-term average, the Baltic Sea is ice-covered at the annual maximum for about 45% of its surface area. The ice-covered area during such a typical winter includes the Gulf of Bothnia, the Gulf of Finland, Gulf of Riga, Väinameri in the Estonian archipelago, the Stockholm archipelago and the Archipelago Sea of Finnish territorial waters. The remainder of the Baltic itself does not freeze during a normal winter, with the exception of sheltered bays and shallow lagoons such as the Curonian Lagoon. The ice reaches its maximum extent in February or March; typical ice thickness in the northernmost areas in the Bothnian Bay, the northern basin of the Gulf of Bothnia, is about 70 cm (28 in) for landfast sea ice. The thickness decreases farther south. Freezing begins in the northern extremities of Gulf of Bothnia typically in middle of November, reaching the open waters of Bothnian Bay in early January. The Bothnian Sea, the basin south Kvarken, freezes on average in late February. The Gulf of Finland and the Gulf of Riga freeze typically in late January. In 2011, the Gulf of Finland was completely frozen on 15 February. The ice extent depends on whether the winter is mild, moderate or severe. Severe winters can lead to ice formation around southern Sweden and even in the Danish straits. According to the 18th-century natural historian William Derham, during the severe winters of 1703 and 1708 the ice cover permeated as far as the Danish straits, parts of the Gulf of Bothnia and Gulf of Finland, in addition to coastal fringes in more southerly locations such as the Gulf of Riga . This description would actually have meant that the whole of the Baltic Sea had been covered with ice. It is known that since 1720, the Baltic Sea has frozen over entirely only 20 times. The most recent case was in early 1987, which was the most severe winter in Scandinavia since that date. The ice then covered 400 000 km2. During the winter of 2010/11, which was quite severe compared to those of the last decades, the maximum ice cover was 315 000 km2, which was reached on 25 February 2011. The ice then extended from the north down to the northern tip of Gotland, with small ice free areas on its either side, and the east coast of the Baltic Sea was covered by an ice sheet ca. 25–100 km (16–62 mi) wide all the way down to Gdańsk. This was brought about by a stagnant high-pressure area that lingered over central and northern Scandinavia from ca. 10 to 24 February. After this, strong southern winds pushed the ice further into the north, and much of the waters north of Gotland were again free of ice, which had then packed against the shores of southern Finland. The effects of the afore-mentioned high-pressure area did not reach the southern parts of the Baltic Sea, and thus the entire sea did not freeze over. However, floating ice was additionally observed near Świnoujście harbour in January 2010. In the recent years prior to 2011, Bothnian Bay and the Bothnian Sea were frozen with solid ice near the Baltic coast and dense floating ice far from it. In 2007 there was almost no ice formation except for a short period in March. During winter, fast ice, which is attached to the shoreline, develops first, rendering the ports unusable without the services of icebreakers. Level ice, ice sludge, pancake ice or rafter ice form in the more open regions. The gleaming expanse of ice is similar to the Arctic, with wind-driven pack ice and ridges up to 15 m. Offshore of the landfast ice, the ice remains very dynamic all year, and it is relatively easily moved around by winds and therefore forms pack ice, made up of large piles and ridges pushed against the landfast ice and shores. In spring, the Gulf of Finland and the Gulf of Bothnia normally thaw in late April, with some ice ridges persisting until May in the eastern extremities of the Gulf of Finland. In the northernmost reaches of the Bothnian Bay, ice usually stays until late May; by early June it is practically always gone. The ice cover is the main habitat for two large mammals, the grey seal (Halichoerus grypus) and the Baltic ringed seal (Pusa hispida botnica), both of which feed underneath the ice and breed on its surface. Of these two seals, only the Baltic ringed seal suffers when there is not adequate ice in the Baltic Sea, as it feeds its young only on ice. The grey seal is adapted to reproducing also with no ice in the sea. The sea ice also harbours several species of algae that live in the bottom and inside unfrozen brine pockets in the ice. The Baltic Sea flows out through the Danish straits; however, the flow is complex. A surface layer of brackish water discharges 940 km³ per year into the North Sea. Due to the difference in salinity, by salinity permeation principle, a sub-surface layer of more saline water moving in the opposite direction brings in 475 km³ per year. It mixes very slowly with the upper waters, resulting in a salinity gradient from top to bottom, with most of the salt water remaining below 40 to 70 m deep. The general circulation is counter-clockwise: northwards along its eastern boundary, and south along the western one . The difference between the outflow and the inflow comes entirely from fresh water. More than 250 streams drain a basin of about 1.6 million km², contributing a volume of 660 km³ per year to the Baltic. They include the major rivers of north Europe, such as the Oder, the Vistula, the Neman, the Daugava and the Neva. Additional fresh water comes from the difference of precipitation less evaporation, which is positive. An important source of salty water are infrequent inflows of North Sea water into the Baltic. Such inflows, important to the Baltic ecosystem because of the oxygen they transport into the Baltic deeps, used to happen on average every four to five years until the 1980s. In recent decades they have become less frequent. The latest three occurred in 1983, 1993 and 2003 suggesting a new inter-inflow period of about ten years. The significant wave height is generally much lower than that of the North Sea. Violent and sudden storms often sweep the surface, due to large transient temperature differences and a long reach of wind. Seasonal winds also cause small changes in sea level, of the order of 0.5 m .
The Baltic Sea's salinity is much lower than that of ocean water (which averages 35‰), as a result of abundant freshwater runoff from the surrounding land, combined with the shallowness of the sea itself; indeed, runoff contributes roughly one-fortieth its total volume per year, as the volume of the basin is about 21,000 km³ and yearly runoff is about 500 km³. The open surface waters of the central basin have salinity of 6 to 8 ‰. At the semi-enclosed bays with major freshwater inflows, such as head of Finnish Gulf with Neva mouth and head of Bothnian gulf with close mouths of Lule, Tornio and Kemi, the salinity is considerably lower. Below 40 to 70 m, the salinity is between 10 and 15 ‰ in the open Baltic Sea, and more than this near Danish Straits. The flow of fresh water into the sea from approximately two-hundred rivers and the introduction of salt from the South builds up a gradient of salinity in the Baltic Sea. Near the Danish straits the salinity is close to that of the Kattegat, but still not fully oceanic, because the saltiest water that passes the straits is still already mixed with considerable amounts of outflow water. The salinity steadily decreases towards North and East. At the northern part of the Gulf of Bothnia the water is no longer salty and many fresh water species live in the sea. The salinity gradient is paralleled by a temperature gradient. These two factors limit many species of animals and plants to a relatively narrow region of Baltic Sea. The most saline water is vertically stratified in the water column to the north, creating a barrier to the exchange of oxygen and nutrients, and fostering completely separate maritime environments. 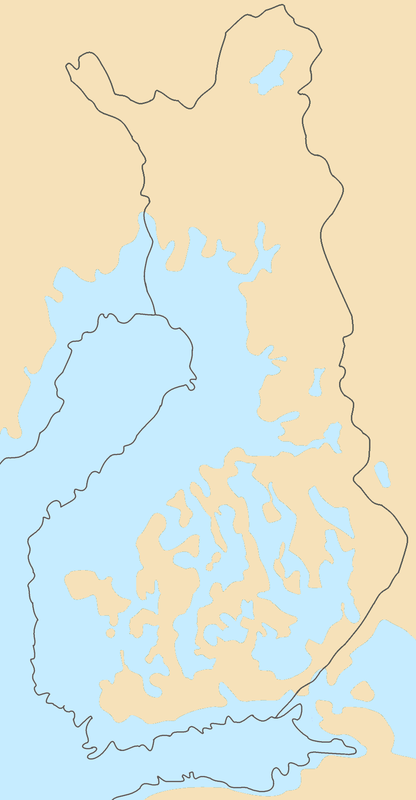 Skerries which are part of the Åland Islands, Finland. Cape Arkona on the island of Rügen in Germany, was a sacred site for pre-Christian Slavs. Ancylus Lake around 8 700 years BP. The relic of Scandinavian Glacier in white. The river Svea älv (Svea river) formed an outlet to the Atlantic. The Baltic Sea somewhat resembles a riverbed, with two tributaries, the Gulf of Finland and Gulf of Bothnia. Geological surveys show that before the Pleistocene instead of the Baltic Sea, there was a wide plain around a big river paleontologists call the Eridanos. Several glaciation episodes during the Pleistocene scooped out the river bed into the sea basin. By the time of the last, or Eemian Stage (MIS 5e), the Eemian sea was in place. Instead of a true sea, the Baltic can even today also be understood as the common estuary of all rivers flowing into it. The land is still emerging isostatically from its subsident state, which was caused by the weight of the last glaciation. The phenomenon is known as post-glacial rebound. Consequently, the surface area and the depth of the sea are diminishing. The uplift is about eight millimetres per year on the Finnish coast of the northernmost Gulf of Bothnia. In the area, the former seabed is only gently sloped, leading to large areas of land being reclaimed in, geologically speaking, relatively short periods (decades and centuries). Phytoplankton algal bloom in the Baltic Proper, 3 July 2001. Since the Baltic Sea is so young there are only a few endemic species, such as the small cockle Parvicardium hauniense and the asexually reproducing alga Fucus radicans. However, several marine species have populations in the Baltic Sea adapted to the low salinity, such as the Baltic Sea herring which is smaller than the Atlantic herring. The benthic fauna consists mainly of Monoporeia affinis, which is originally a freshwater species. The lack of tides has affected the marine species as compared with the Atlantic. The fish fauna of the Baltic sea is a mixture of marine species such as cod, herring, hake, plaice, flounder, shorthorn sculpin and turbot, and freshwater species such as perch, pike, whitefish and roach. A peculiar feature of the fauna is that it contains a number of glacial relict species, isolated populations of arctic species which have remained in the Baltic Sea since the last glaciation, such as the large isopod Saduria entomon, the Baltic subspecies of ringed seal, and the fourhorn sculpin. There is a decrease in faunal species from the Belts to the Gulf of Bothnia. The decreasing salinity along this path causes restrictions in both physiology and habitats. Satellite images taken in July 2010 revealed a massive algal bloom covering 377,000 square kilometres (146,000 sq mi) in the Baltic Sea. The area of the bloom extends from Germany and Poland to Finland. Researchers of the phenomenon have indicated that algal blooms have occurred every summer for decades. Fertilizer runoff from surrounding agricultural land has exacerbated the problem and led to increased eutrophication. Construction of the Great Belt Bridge in Denmark (completed 1997) and the Øresund Bridge-Tunnel (completed 1999), linking Denmark with Sweden, provided a highway and railroad connection between Sweden and the Danish mainland (the Jutland Peninsula). The undersea tunnel of the Øresund Bridge-Tunnel provides for navigation of large ships into and out of the Baltic Sea. The Baltic Sea is the main trade route for export of Russian petroleum. Many of the countries neighboring the Baltic Sea have been concerned about this, since a major oil leak in a seagoing tanker would be disastrous for the Baltic—given the slow exchange of water. The tourism industry surrounding the Baltic Sea is naturally concerned about oil pollution. Much shipbuilding is carried out in the shipyards around the Baltic Sea. The largest shipyards are at Gdańsk, Gdynia, and Szczecin, Poland; Kiel, Germany; Karlskrona, Sweden; Malmö, Sweden; Rauma, Turku, and Helsinki, Finland; Riga, Ventspils, and Liepāja (Latvia); Klaipėda (Lithuania); and St. Petersburg, Russia. European Route of Brick Gothic is a touristic route connecting cities with Brick Gothic architecture in seven countries along the Baltic Sea: Sweden, Denmark, Germany, Poland, Lithuania, Latvia and Estonia. ^ Tacitus, Germania (book): Ergo iam dextro Suebici maris litore Aestiorum gentes adluuntur, quibus ritus habitusque Sueborum, lingua Britannicae propior. – Upon the right of the Suevian Sea the AEstyan nations reside, who use the same customs and attire with the Suevians; their language more resembles that of Britain. ^ (Swedish) Balteus in Nordisk familjebok. ^ Forbes, Nevill (1910). The Position of the Slavonic Languages at the present day. Oxford University Press. p. 7. http://archive.org/stream/positionslavoni00forbgoog#page/n9/mode/1up. ^ Dini, Pierto Umberto (2000)  (in Latvian). Baltu valodas. Translated from Italian by Dace Meiere. Riga: Jānis Roze. ISBN 9984-623-96-3. ^ Activities 2006: Overview Baltic Sea Environment Proceedings No. 112. Helsinki Commission. ^ Sztobryn, Marzenna (2005). "Sturmfluten in der südlichen Ostsee (Westlicher und mittlerer Teil)" (in German). Berichte des Bundesamtes für Seeschifffahrt und Hydrographie (39). ^ "Sturmfluten an der Ostseeküste – eine vergessene Gefahr? [Storm floods along the Baltic Sea coastline – a forgotten threat?]". Informations-, Lern-, und Lehrmodule zu den Themen Küste, Meer und Integriertes Küstenzonenmanagement. EUCC Die Küsten Union Deutschland e. V.. http://www.ikzm-d.de/inhalt.php?page=129,2843. Retrieved 2 July 2012. Citing Weiss, D.. "Schutz der Ostseeküste von Mecklenburg-Vorpommern". In Kramer, J.; Rohde, H. (in German). Historischer Küstenschutz: Deichbau, Inselschutz und Binnenentwässerung an Nord- und Ostsee [Historical coastal protection: construction of dikes, insular protection and inland drainage at North Sea and Baltic Sea]. Stuttgart: Wittwer. pp. 536–567. ^ Tiesel, Reiner (October 2003). "Sturmfluten an der deutschen Ostseeküste [Storm floods at the German Baltic Sea coasts]" (in German). Informations-, Lern-, und Lehrmodule zu den Themen Küste, Meer und Integriertes Küstenzonenmanagement. EUCC Die Küsten Union Deutschland e. V.. http://www.ikzm-d.de/showaddon.php?text=386. Retrieved 2 July 2012. ^ Geography of the Baltic Sea Area at envir.ee. (archived) (2006-04-21). Retrieved on 23 June 2011. ^ "Limits of Oceans and Seas, 3rd edition". International Hydrographic Organization. 1953. http://www.iho-ohi.net/iho_pubs/standard/S-23/S23_1953.pdf. Retrieved 6 February 2010. ^ Derham, Physico-Theology: Or, A Demonstration of the Being and Attributes of God from His Works of Creation (London, 1713). ^ Helsingin Sanomat, 10 February 2011, p. A4. ^ Helsingin Sanomat, 25 February 2011, p. A5. ^ Helsingin Sanomat, 11 June 2011, p. A12. ^ Sea Ice survey, Space Science and Engineering Centre, University of Wisconsin. ^ The Baltic Sea: Its Past, Present and FuturePDF (352 KB), Jan Thulin and Andris Andrushaitis, Religion, Science and the Environment Symposium V on the Baltic Sea (2003). ^ Statistische Kurzinformation (in German). Landeshauptstadt Kiel. Amt für Kommunikation, Standortmarketing und Wirtschaftsfragen Abteilung Statistik. Retrieved on 11 October 2012. ^ "Oxygenation at a Depth of 120 Meters Could Save the Baltic Sea, Researchers Demonstrate". Science Daily. http://www.sciencedaily.com/releases/2011/04/110418141617.htm. ^ Lockwood, A. P. M.; Sheader, M.; Williams, J. A. (1998). "Life in Estuaries, Salt Marshes, Lagoons and Coastal Waters". In Summerhayes, C. P.; Thorpe, S. A.. Oceanography: An Illustrated Guide (2nd ed.). London: Manson Publishing. p. 246. ISBN 1-874545-37-5. ^ "Satellite spies vast algal bloom in Baltic Sea". BBC News. 23 July 2010. Archived from the original on 26 July 2010. http://web.archive.org/web/20100726191305/http://www.bbc.co.uk/news/science-environment-10740097. Retrieved 27 July 2010. ^ Helcom : Welcome. Helcom.fi. Retrieved on 23 June 2011. Protect the Baltic Sea while its still not too late. This page uses content from the English language Wikipedia. The original content was at Baltic Sea. The list of authors can be seen in the page history. As with this Familypedia wiki, the content of Wikipedia is available under the Creative Commons License.